For those of you who are interested in seeing me do something other than a SQL Saturday presentation, the concert band in which I perform will be performing at the Association of Concert Bands (ACB) Convention in northern New Jersey on Saturday, April 27! We will be performing at 3:00 at the Woodcliff Lake Hilton in Woodcliff Lake, NJ. This is an opportunity to catch me in an environment that involves my biggest extracurricular activity outside of my work. Come on out and catch a good concert! Hope to see you a week from Saturday! My wife and I built (well, okay, not literally) our house in which we’re currently living. While it was under construction, I went to visit the site roughly every other day. I wanted to check on progress and make sure there weren’t any issues. Besides that, I enjoyed watching the structure go up. I remember at one point talking to one of the house builders. I commended him and his workers. I remember mentioning something about how fun the work looked, and how much I was learning by watching the process. I also recall thinking about how fun it could be to build houses for a living. This morning, I stumbled across this article that talked about the stigma of choosing trade school over college. It made me think about current career mindsets, enough to the point where I felt compelled to write this article. We need doctors, engineers, writers, architects, and teachers. These are professionals that require college degrees. We also need framers, linespeople, plumbers, electricians, carpenters, mechanics, food service workers, and construction workers. These professions might not require college degrees, but they are skilled workers, and they are just as important. The German education system includes the Gymnasium, which is akin to our standard college preparatory high school. However, for people not looking to attend college, people have the option of attending a Hauptschule or a Realschule. High school programs in the US most often act as preparation for college, and those people who do so are perceived as being successful. Here in New York state, BOCES programs serve a similar purpose to hauptschules and realschules in that they provide education services, including vocational education, to students who struggle with the college prep route. Just because people don’t pursue the traditional college route doesn’t make them unskilled. I’ve watched plumbers, electricians, and welders at work, and I can tell you that I couldn’t do a lot of what they do. I’m not saying that I’m not capable of it; I’m just saying that I don’t have the skill sets that they worked hard to have, just as much as I have the skill sets that I have. Chris Bell, one of my friends on the SQL Saturday circuit, once gave me a great piece of advice. He told me, “the definition of an expert is someone who knows something that you don’t.” I’ve never forgotten that tidbit. So why is there such a stigma attached to people who pursue the vo-tech route? I’m not an expert, but if I ventured a guess, I’d say that people tend to look down on those who aren’t as skilled in various aspects — people who tend to pursue vocational education. But maybe some people just don’t want to go the college route. Not everyone is cut out for college. Maybe some people aren’t interested in pursuing a degree. Maybe some people feel their skills are better suited elsewhere. Maybe some people have a learning disability that prevents them from academic pursuits, but have other skills in which they can be employed. Whatever the reason, there should be no shame in pursuing vocational training. People should pursue careers that suit them — and if they’re happy in their chosen professions, then we’re all better off for it. My client office is in the process of redesigning and rebuilding the office space. The old environment was the traditional “cubicle farm,” along with individual offices used by managers. The new environment — still a work in progress — eliminates the cubicles and utilizes a more open office environment. Each worker who is not a director will have a desk — and not much more. I have mixed feelings about the new setup. For over a year, space has been an issue; there had been talk about moving to a larger office. The new setup maximizes the use of space. The office spaces have a sleek, modern new look; it looks like a brand-new workspace (which it is), and the new furnishings appear comfortable and attractive. A part of me looks forward to relocating to a clean and shiny new desk. 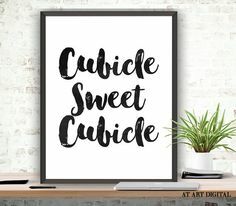 At the same time, it also leaves something to be desired; privacy is non-existent, I have no place to hang my jacket (I do NOT like putting it on the back of my chair), and seeing that many of us participate in virtual meetings through our computers, it could potentially get noisy. Throughout my professional career, I’ve had a variety of workspaces. In my first job out of college, I didn’t even have a desk of my own; my “workspace” was a data center. Granted, I didn’t do a lot of “sitting at a desk” at that job; much of what I did involved roaming around the data center. Nevertheless, I wasn’t too happy that I didn’t have a space that I could call my own. My next job (and for many jobs afterward), I had my own cubicle. I once had an office (that I shared with another guy) with its own window and door. (I even bought a small dorm-sized cube refrigerator that we shared.) Other times, I worked (as I do now) in an open shared office space. And every once in a while when the need arises (daytime appointment, illness, bad weather, etc. ), I’ll work at home in my own living room, sitting in my recliner with the TV on, my laptop, and (sometimes) Bernard — our tuxedo cat and my co-worker for that day — in front of me. I wrote in an earlier article that I believe a comfortable workspace is important. (For the sake of context, “comfortable” means “I feel good in my workspace,” as opposed to “I love my job.”) Most of my waking hours during a typical week, I am in my workspace; for all intents and purposes, it is my home away from home. If I spend so much time at my workspace, I want it to be comfortable. What makes a perfect workspace? It depends on the person. Personally, I like having multiple large monitors, a comfortable adjustable chair (that I always adjust to its highest position), a place to hang my coat (again, NOT on the back of my chair), some type of climate control (I usually prefer it cooler, so I usually have a small fan at my desk), a little space where I can put my wife’s picture on my desk and a Syracuse pennant on the wall, and a little bit of privacy while still maintaining some face time with my co-workers. Even those requirements have changed over the years; at one point or another, I would’ve wanted a door that closed, a window with a view, and a place where I could put a small refrigerator. As time passed, those features became less important to me. No workspace will ever be “perfect.” No matter how comfortable you make your work environment, there will always be some kind of flaw. Nevertheless, it should be a place where you’re comfortable while being productive. Consider it your “home” when you’re at work — because that’s essentially what it is. My previous post got me thinking about setting goals. I mentioned in my previous article that I hate setting New Year’s “resolutions.” I didn’t want to get into why in that article. Well, in this article, I want to get into exactly why. How many of you have made New Year’s resolutions? How many of you made them in years past? How many resolutions did you keep? If I had to guess, probably not many, if any. This is why I hate resolutions. They’re almost guaranteed to fail. Case in point: for those of you who go to a gym and work out, how packed is the gym in January? In all likelihood, it’s packed with people who resolved to go to the gym and work out this year. Now, how many of these people are still at the gym by the end of the year? Or by July? Or even April? I gave up making resolutions a long time ago. All I was doing was breaking promises to myself. And every time I did so, I just ended up disappointing myself. Don’t set resolutions. Instead, set goals. If you want to do something to better yourself, setting goals is far superior to making resolutions. Goals are measurable. Let’s say you make a resolution to lose weight and go to the gym. That’s awfully vague, isn’t it? That can mean almost anything. Let’s say you join a gym on January 1, do one workout, and never go again. You might say you broke your resolution. But did you really? You went once. That counts, doesn’t it? However, let’s say you set a goal to lose ten pounds by the end of the year. Now you have something to shoot for, and it’s something that can be measured. You can keep track of how much weight you lose until you reach your goal, and you can measure aspects (calories, number of workouts, etc.) that will help you get there. A goal is a target. In addition to being measurable, a goal gives you something toward which you can aim. You might hit it. You might not. Either way, you gave it a shot. Resolutions, on the other hand, are almost always doomed to fail. If you miss your goal, that’s okay. When you break a resolution, you feel like you failed. It brings you down. It un-motivates you. However, if you miss a goal, it’s not the end of the world. You can either try again, or reset your goal toward something more manageable. Goals are adjustable. If you find that a goal is unattainable, you can adjust it so it’s more attainable. And once you reach a goal, you can reset a higher goal, which will make you even better. Goals can be set any time. Ever make a resolution in July? I didn’t think so. However, you don’t have to wait until the new year to set a goal. You can set them any time you want. Personally, I’ve set a few small goals. For one thing, I don’t have much arm strength, so I struggle with any workout routine that involves supporting my own weight with my arms — pull-ups, rope climbs, handstands, etc. I set a goal of doing at least one real pull-up by the end of the year. Also, my home is, admittedly, a cluttered mess (it looks like it belongs on an episode of Hoarders). I told my wife that I would set a goal of decluttering a room at a time — the kitchen within a few weeks, the living room a few weeks after that, and so on. There are a number of others I’d like to set as well, but I haven’t yet gotten around to setting them. As I go along, I’ll figure out what I need to accomplish, set my goals, and take steps to reach them. Again, I can set goals any time I want. I don’t have to wait until next year. So what do you want to accomplish? What steps will you take to reach them? Whatever they are, you will be more likely to succeed by setting goals rather than making resolutions and empty promises to yourself. A little humor for your holiday!